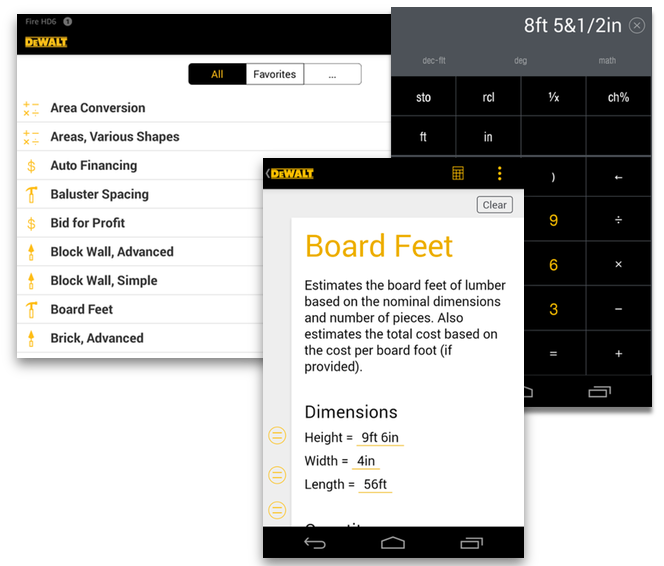 DEWALT® Mobile Pro™ is a full-featured calculator and reference tool designed specifically for construction professionals. Get the job done right the first time. Download the construction and scientific calculator plus templates for every jobsite calculation, from area and length conversions to estimating studs and drywall. In addition to the free capabilities, DEWALT Mobile Pro offers in-app purchases related to carpentry, concrete, business math, finish materials, trim work, landscaping, and site work. DEWALT Mobile Pro is designed specifically for construction pros. Provides instant answers to critical job-site questions. Remembers the math so you don’t have to. Uses real-world examples to explain concepts. Helps you visualize the situation with detailed illustrations. Offers a wide range of trade-specific add-ons. Gives you instant and exclusive access to valuable content. DEWALT Mobile Pro is a handy mobile resource. Share calculation results instantly by email. Search, filter, and create favorites to make calculations easy to find. Access DEWALT resources directly from the app, find service centers, and more. Powerful construction calculator that includes foot-inch math for lengths, areas and volumes. Area, length and volume conversions. Area and volume shape math including circles, squares, rectangles and polygons. Formulas for estimating studs, drywall, and concrete slabs. Foot-inch math for lengths, areas and volumes. Powers, logs, trigonometric and hyperbolic math functions.